Scarecrows. What a great subject for a horror movie! Despite the inherent scariness of the stuffed composites, only three notable ones have managed to secure a place in horror history. 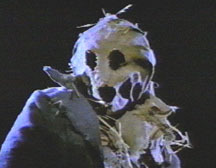 While Scarecrows (1988) and Night of the Scarecrow (1994) are good attempts (the former is better), the best of the scarecrow lot is the superior TV horror movie Dark Night of the Scarecrow which made its debut in November of 1981. Since then, it's become a staple on some cable stations during the Halloween season and is a much sought after home video title. Directed by Frank DeFelitta, Dark Night of the Scarecrow is a taut production about friendship, prejudice and revenge - which puts it in a league with the best thrillers produced for the small screen. The film's impact is made even stronger by its high degree of violence, which is unusual for a non-theatrical release. DeFelitta was primarily a novelist, whose works include The Entity and Audrey Rose (for which he served as producer on the movie version) and he had previously directed the excellent Lindsay Wagner time travel film, The Two Worlds of Jennie Logan. Charles Elliot Ritter (Larry Drake) or "Bubba" as he's known, is a 36 year-old mentally challenged man who loves children. 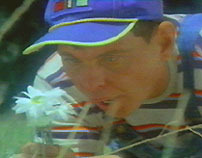 He likes to spend time with a young girl named Marylee Williams (Tonya Crowe) in a field, where she one day gives him a lei she made out of flowers. 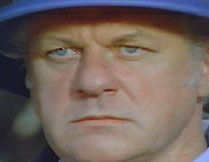 Otis P. Hazelrigg (Charles Durning), the local mailman, watches disapprovingly through a pair of binoculars. "He's out there again and he's got the Williams girl," Otis tells his buddy Harless (Lane Smith). Fearing that Bubba might molest the child, the men consider their options. They've talked before about doing something to the "idiot" but Otis feels it needs to be drastic. "Something's gotta be done but it has to be permanent," he says. Harless is hesitant because Bubba hasn't committed an actual crime. Marylee sneaks into a neighbor's backyard to admire a water fountain. Bubba is afraid to trespass and waits behind a wooden gate. Suddenly, a vicious guard dog appears and attacks the girl. Bubba watches helplessly and carries Marylee's limp body to her house. Mrs. Williams answers the door and screams at the sight. 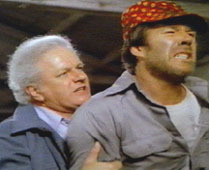 Harless rushes over to the post office when he hears the news and tells Otis that Bubba has "done it." He says the Williams girl is dead and Otis immediately loads his gun. It's just the excuse they've been waiting for. Despite the fact that the sheriff has asked that volunteers who wish to search for the suspect gather at the courthouse, Otis says they'll do it themselves. They pack a truck with guns and dogs and then pick up their other friends Skeeter (Robert F. Lyons) and Philby (Claude Earl Jones). Bubba rushes to get to his house as the men and sniff hounds are in pursuit. 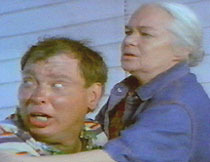 He falls into the arms of his mother (played by Jocelyn Brando) on their porch. Frightened for his life, he tells her he didn't do anything bad. Mrs. Ritter doesn't know what he's talking about but she vows not to let anyone hurt her son. She tells Bubba to play "the hiding game" which they've done before whenever his detractors have come looking for him. When Otis and the gang arrive at the Ritter house, they call out Bubba's name. Mrs. Ritter tells them to get off her property and asks what her son has been accused of. Otis mentions the Williams girl and Mrs. Ritter says there's no way Bubba could have done something to her because he would never harm a child. The dogs can smell Bubba's scent and it's obvious he's been there. Still, Mrs. Ritter won't turn her son in and she goes back in the house...slamming the door on the men. It appears that Bubba ran into a nearby field and the men continue their search. The dogs lead them to a scarecrow and Otis and his men can't figure out why. 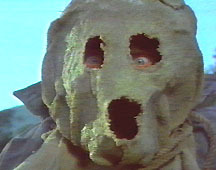 When Otis gets a closer look, he can see there's someone human in the scarecrow outfit. They've found who they were looking for. Shaking from fright, Bubba's eyes speak for themselves but the men are too filled with hate to care. Otis, Skeeter, Harless and Philby fire several rounds at their target. Bubba has been killed and Harless gets a call on his radio. He's told that Marylee Williams was attacked by a dog and has survived. What's more...by carrying her to safety, Bubba actually saved her life. The assassins can't believe their ears. Otis takes a pitchfork and plants it under the dead man's arm. His battered body is left behind in the field. A trial begins and Sam (Ed Call), the District Attorney, argues that the men are vigilantes and had no right to take the law into their own hands. The defense produces the pitchfork to somehow imply that Bubba was a threat to them. Otis is placed on the witness stand and the judge asks him if the deceased was given a chance to surrender himself. Otis says, "yes your honor, we did. Several times. In fact, we even fired some shots in the air." Mrs. Ritter sits in the courtroom and has to listen to this character attack on her son. She's heartbroken as she hears about Bubba having twenty-one bullet wounds in him. Since there is no hard evidence and the defendants are well respected in the community, the judge finds no probable cause and orders them released immediately. Mrs. Ritter is upset and screams out in court, calling the men murderers. She yells out, "there's other justice in this world besides the law!" The D.A. confronts the men outside the courtroom and tells them he's convinced they executed Bubba Ritter. He says if he ever finds any evidence, he will bring them to trial and make sure they end up on death row. Otis thumbs his nose at him by making a joke about the matter. That evening, the four friends celebrate at the Bogan Cafe, their favorite hangout. They drink merrily and laugh off the entire affair. Meanwhile, Mrs. Williams and her husband Frank (Jim Tartan) are worried about their daughter, who hasn't been the same since that fateful day. Although Marylee is physically okay, her mother is realizing that the girl had a strong attachment to Bubba. In fact, she hasn't had the heart to tell her he's dead. Franks says they should leave it that way and not say anything. Marylee wakes up from her sleep one night and sneaks out of her house. She goes to the Ritter home and knocks on Bubba's bedroom window. There's no answer so she goes inside...where she finds the lei she gave her friend in the living room. Mrs. Ritter wonders what she's doing running around at that time of the night. 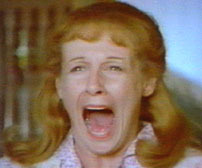 When Marylee asks where Bubba is, his mother tells her he's gone to "where they can't hurt him no more." Marylee doesn't understand and tells Mrs. Ritter she knows where Bubba used to hide. She runs into the field and the elder woman follows her to the spot where he was killed. She sees the girl sitting on the ground singing the tune they used to sing together. Marylee says he isn't gone - he's just playing a game. Otis and his friends go on about their business as if nothing happened. One afternoon, Harless' wife asks him if he's planting anything and he says he isn't. "If you're not planting, why would you put up a scarecrow?" she wonders. Sure enough, Harless sees it in the middle of a field near their home. Convinced it's a practical joke, he confronts Skeeter and Philby but they deny having anything to do with it. The three stop by to visit Otis in the boarding home where he lives and they tell him about this new development. Harless says the scarecrow is covered with bullet holes, except this time it's filled with straw. Otis is sure the District Attorney is behind it. He tells his friends to go home and stop looking so guilty. Harless finds the scarecrow gone. A light from his barn catches his attention and he tries to find out who's in there. He calls out the prosecutor's name and climbs a ladder to the second level. Suddenly, his brush machine is mysteriously turned on. Harless loses his footing and falls into it. Otis finds out about his friend's freak accident during breakfast the next morning. He firmly believes it was just a case of bad luck - although Philby and Skeeter suspect that someone knows they purposely murdered Bubba and is trying to get back at them. One question remains unanswered. If Harless was working and turned on the brush machine, why was it turned off when they found him? The men go out to the barn to check the fuel in the machine. Otis delivers the mail to the Ritter house in the morning and sees Marylee leaving. He has a package for Mrs. Ritter, who signs for it. Before he departs, he brings up the mishap that took his friend's life and reminds her of the "other justice" comment she made in the courtroom. Mrs. Ritter stands by her belief. Otis thinks she may have something to do with the accident and says they're even...a life for a life. "Not hardly. It ain't even. Not so long as you're walking," she tells him. She turns the tables on him and suggests that he may have his own unnatural designs on the little girl. Later that day, Philby finds the scarecrow on his property and drops to his knees in front of it. Halloween arrives and the local church throws a costume party. Otis finds Marylee and tries to talk to her. He pretends he's friendly with Mrs. Ritter to get information from the girl. Marylee tells him she knows what he did to Bubba because her friend told her. When Otis says Bubba is dead, the young girl tells him she already knows and runs off. Otis chases her until a security guard points him in another direction. He goes back to the party where the "non-drinker" pours himself a glass of spiked punch. He spots Philby and Skeeter - and Philby tells him about the scarecrow's reappearance. They go to the field with flashlights and it isn't there. Philby, who has heart trouble, is frightened but Otis doesn't think they should go to the police. 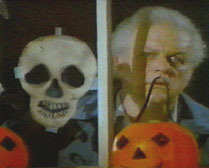 Instead, Otis sneaks into Mrs. Ritter's home and warns her to stop scaring his friends. While he has his hand on her mouth, Otis causes the woman to have a heart attack. He panics and sets the gas on the stove. The flames from the fireplace cause the entire house to explode. Marylee finds the place in ruins the next day. The D.A. is there, looking for evidence of foul play. Philby is working late on his farm. He sees someone or something lurking nearby and tries to drive off. The car won't start so he runs into a grain silo and hides. He finds himself locked in and the equipment suddenly activates, burying him alive. Otis breaks the news to Skeeter, who freaks out. He tells him that Bubba may be behind what's been happening. Skeeter says they killed him but Otis reminds him that they can't be sure because they left his body behind. He says Marylee told him at the carnival that she still speaks to Bubba. To see for themselves, Otis and Skeeter go to Bubba's grave. They dig up the casket and find the body intact. Despite this, Skeeter breaks into hysterics and Otis tries to calm him down. He says he now believes the Williams girl is behind it and suggests they have to get rid of her. Skeeter won't have any part of it so Otis kills him by whacking him on the head with a shovel, as they're about to fill the grave again. He conveniently buries his friend along with Bubba's corpse. Otis takes off into the darkness in his mail truck. He stops when he sees Marylee standing near a field in her nightgown. She runs away and he follows her...before having an accident and crashing into a tree. The girl hides next to a tractor but Otis spots her and grabs the girl in a pumpkin patch. "It was you!" he yells - as the girl screams for help. Suddenly, the tractor lights turn on and the vehicle tries to run him down. 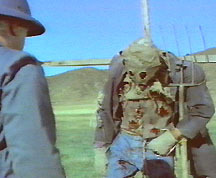 Otis attempts to get away and bumps right into the scarecrow, who is holding a pitchfork. He falls to the ground with blood gushing from his stomach and mouth. 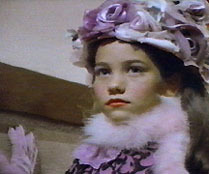 Marylee looks up at the scarecrow, which turns its head towards her and hands her a flower. The little girl says, "thank you Bubba. Tomorrow, I think I'll teach you a new game. Did I ever show you how to play the chasing game? It's fun. You'll like it, it's sort of like playing tag..."
Frank De Felitta's sure hand at directing made this an above average film. 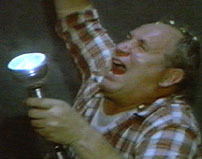 Others who were responsible for turning out such a competently done tale, include Vincent A. Martinelli for his cinematography and Glenn Paxton for his eerie, well-paced score. If there is anyone who doubts a TV movie can be as good as a theatrical feature, they should check this one out. 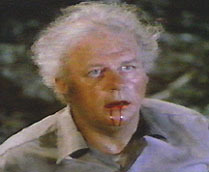 Charles Durning, who usually plays such nice guys, is one of the all-time great malicious villains in this film. A tyrannical, murderous postal worker! Who knew? A prime example of how this medium could be genuinely chilling and as effective as its big screen counterparts, this one has a simple plot, good acting and a helpful autumnal setting. 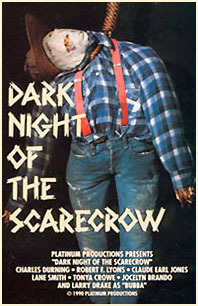 With a death count of six, Dark Night of the Scarecrow is certainly one of the more violent and unusual thrillers to be made for the small screen. It's perfect viewing for a Halloween night. The ending might just send chills down your spine...or put a lump in your throat.